Seagrasses draw fertilizer runoff and other pollutants out of the water, locking them safely away in meadow soil. 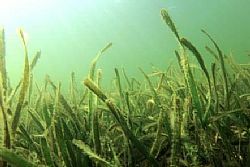 Scientists have estimated that an acre of seagrass provides more than $11,000 worth of filtering every year. Every continent save Antarctica is ringed by vast stretches of seagrass, underwater prairies that together cover an area roughly equal to California. Seagrass meadows, among the most endangered ecosystems on Earth, play an outsize role in the health of the oceans. They shelter important fish species, filter pollutants from seawater, and lock up huge amounts of atmosphere-warming carbon. But the meadows are vanishing at a rate of a football field every 30 minutes. Joleah B. Lamb, a postdoctoral researcher at Cornell University and the lead author of the new study, said she hoped it would help draw attention to their plight.